The CH7301C is a display controller device which accepts a digital graphics input signal, and encodes and transmits data through a DVI or DFP (Digital flat panel). The device accepts data over one 12-bit wide variable voltage data port which supports different data formats including RGB and YCrCb. 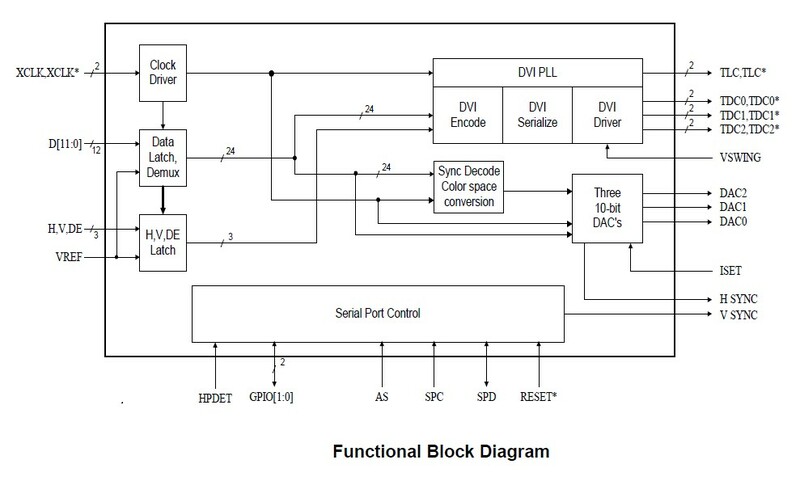 The DVI processor includes a low jitter PLL for generation of the high frequency serialized clock, and all circuitry required to encode, serialize and transmit data. The CH7301C comes in versions able to drive a DFP display at a pixel rate of up to 165MHz, supporting UXGA resolution displays. No scaling of input data is performed on the data output to the DVI device. See Figure 1 for the functional block diagram of the CH7301C. Color space conversion from YCrCb to RGB is supported in both DVI and VGA bypass modes. CH7301 Registers Read/Write Operation, AN-41.pdf. A PCB Design Guideline to Prevent DVI Signaling Power-Reverting in CH7301, AN-57.pdf. PCB Layout and Design Considerations for CH7301C DVI Output Device, AN-68.pdf. DACs Connection Detection of CH7301 Encoders, AN-71.pdf. DVI Output Eye Diagrams of CH7301A vs. CH7301B, TB-41.pdf. PCB Design Considerations of DAC outputs with Multiple Video Formats, TB-45.pdf.